In 2011, when Jessica Koslow opened her popular Virgil Village restaurant Sqirl with a brown rice porridge on the menu, she had L.A.’s eating habits in mind. “When you think about L.A., you think about considering all sorts of dietary restrictions and allergies,” Koslow says. “What can you do that’s gluten free, that’s a counterpart to toast, and feels like breakfast?” Toasts may still be Koslow’s most popular output, but that sweet brown rice porridge has maintained its place on the menu; it’s since been joined by a savory version featuring chicken, tomato, lime, and cardamom ghee. Porridge had long been regarded as little more than boiled grains—economical and rib-sticking—but at restaurants throughout Los Angeles, it’s become a sophisticated $12 meal that upends preconceived notions about the dish’s inherent simplicity. It’s the bowl of comfort food giving ramen and pho a run for their money, and eye-catching platings have made it an unlikely social media magnet. But even as porridge’s ubiquity seems to increase, local chefs are quick to note that it’s more culinary tradition than trend. That makes sense—many Asian cultures have their own take on congee, a porridge often salted with fish or meat ingredients. Chinese baizhou is a plain affair accompanied with pickled vegetables (zhacai) and fried breadsticks (youtiao); Cantonese juk easily occupies an eight-option spread at most dim sum houses; Korean juk is an event unto itself, a meal that comes with unlimited banchan in L.A.’s Koreatown. And many Asian-American children grow up with a post-Thanksgiving version of juk, thrown together from turkey scraps and cartilage. 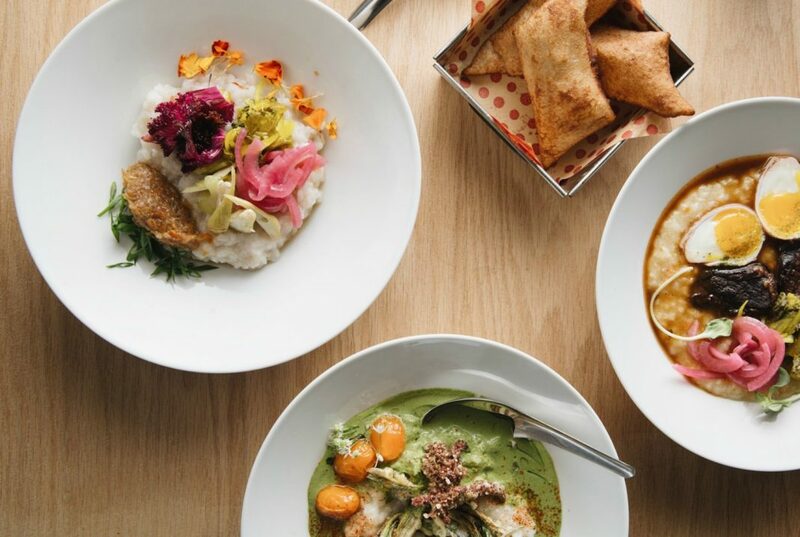 Minh Phan has taken her Vietnamese heritage and infused it into Porridge & Puffs, a venture that began as a pop-up in Hollywood but has since become a brick-and-mortar restaurant in Historic Filipinotown. The porridge at Porridge & Puffs is gorgeous, an aesthetically stunning bowl of boiled grains and stock, with florals, microgreens, and pickled veggies for boosted color. The classic short rib porridge is a deliciously soft mix of meaty flavors punctuated by turmeric-fermented mustard greens for a sour kick. It’s also unbelievably filling. Other standouts include Little Sister’s duck congee, a bowl large enough to last two meals; and, until the restaurant shuttered on October 5, Good Girl Dinette’s grandma’s porridge. The Korean franchise Bonjuk’s menu features 16 types of porridge ranging from abalone to mushroom. The revolution in ancient grains—where they come from, how they can be used—has facilitated the creativity behind elevated porridge. That, along with the evolution of L.A.’s culinary scene, has allowed for the retooling of all sorts of simple staples, from toast to porridge. When celebrity chef Hugh Acheson sampled the chicken porridge at Sqirl, he told Koslow, “You know you’re feeding people chicken and rice soup for breakfast.” Call it what you want, porridge’s time is now.